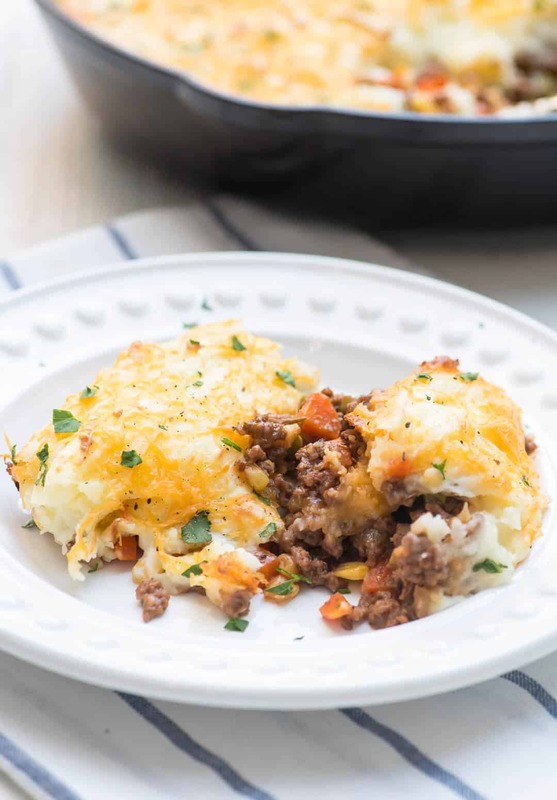 A delicious mixture of seasoned ground beef and vegetables is topped with a layer of mashed potatoes, sprinkled with cheddar cheese, and baked until golden brown. 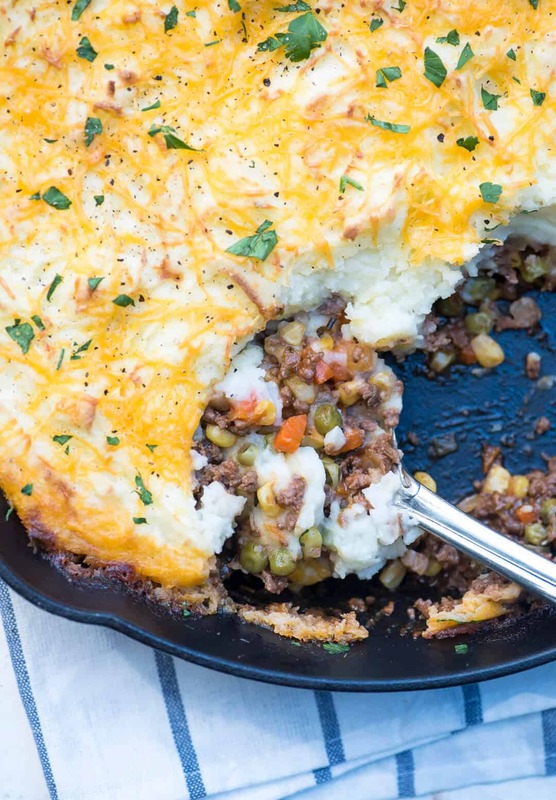 This Skillet Shepherd’s Pie is a quick and easy version of the classic dish. Gather ’round my meat and potato lovers. You’ll want to come in close for this one. 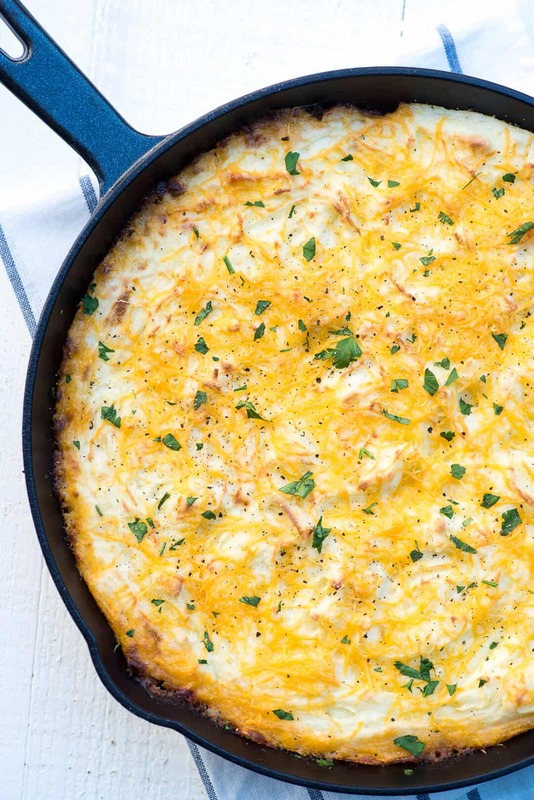 This skillet full of deliciousness has family-friendly written all over it. It’s also pretty darn easy to put together and reheats beautifully if you’re lucky enough to have leftovers. 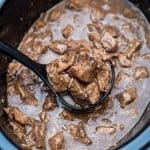 There is even an option that will make this a super quick one pot meal. More on that in just a bit. First, I feel a little explanation is in order. 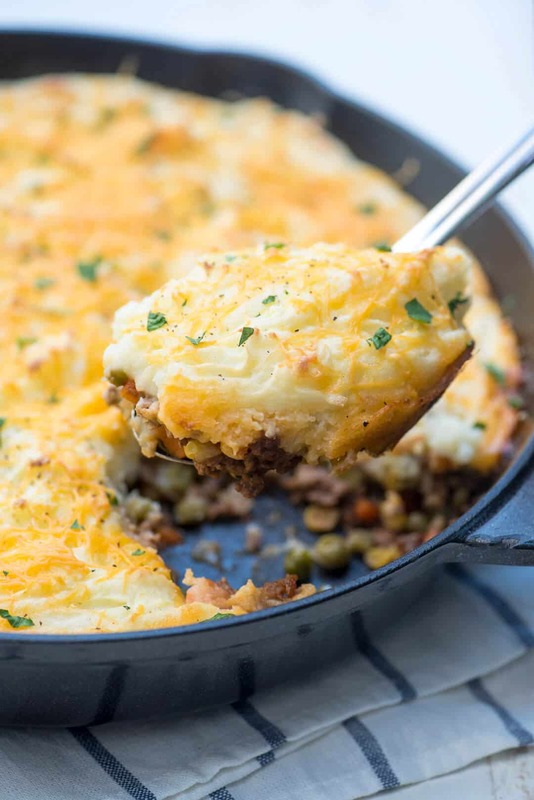 Shepherd’s Pie is a well-loved, traditional dish in Britain, Ireland, and Scotland. 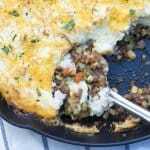 Historically it was always made with lamb but recipes for Shepherd’s Pie were long ago “Americanized” by us here in the U.S. using ingredients most readily available, which explains the ground beef in this recipe. 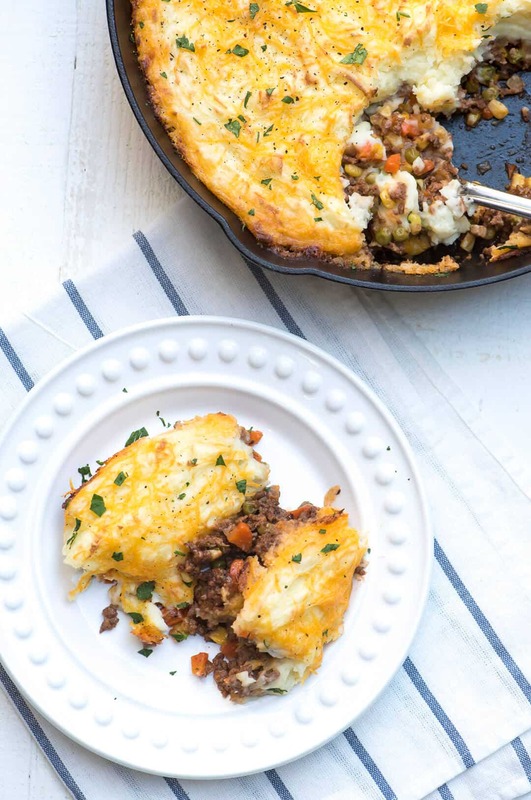 In the U.K. they would refer to it as Cottage Pie when made with beef, but we’re sticking with the name we all came to know it by and the term I know most people will search for when looking for a recipe like this. And now, back to the good stuff! The filling includes ground beef, onion, carrots, peas, and corn seasoned with rosemary and thyme. 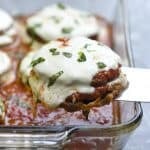 I add richness with a little tomato paste and beef broth and top the lovely filling with mashed potatoes and a sprinkling of finely grated cheddar cheese. When you take a look at the recipe card below, you’ll see I’ve added a little sour cream to the mashed potato mixture. I’ve found that when I add a little dairy (sour cream or cream cheese) to my mashed potatoes, they hold a better texture when reheated. Since leftovers are always the goal, I like to be sure it will be just as fabulous the second time around. It also means that if you’d like to make the mashed potatoes in advance, you can do that, making it even faster to pull this dish together at dinner time. 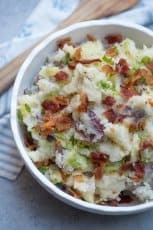 To make this a one-pot meal, make the mashed potatoes in advance so they are ready to go or feel free to use store-bought mashed potatoes. After the filling is prepared on the stove, the mashed potatoes are spooned over the top. I use the back of a spoon to smooth the surface then run a fork through the potatoes to create a rustic roughed-up appearance. The skillet is transferred to the oven for about 20 minutes and then I switch my oven to Broil for just a couple of minutes to create that crisped, golden brown crust. Check out the quick video below to see how it’s done. 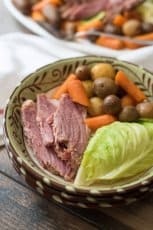 If you’re not feeling the corned beef this year for St. Patrick’s Day, this dish is an excellent option. 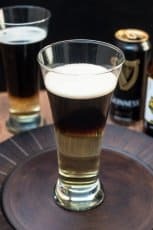 Pop open a Guinness or two and enjoy! 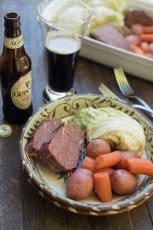 For even more inspiration be sure to check out my St. Patrick’s Day archives. Peel the potatoes and cut into quarters. Place in a good sized pot and cover with cold water. Set over HIGH heat, cover and bring to a boil. Once boiling, reduce heat to LOW and allow potatoes to simmer until tender when pierced with a fork, approximately 15 to 20 minutes. Meanwhile, get started on the filling. Add olive oil to a 12" oven-proof skillet and place over MEDIUM heat. Add ground beef and cook, stirring to break up. Season with 1/2 teaspoon salt and 1/2 fresh ground black pepper and continue to cook until meat is no longer pink. Drain grease and transfer cooked beef to a plate. Add remaining olive oil to empty skillet and return to MEDIUM heat. Add onion and carrot and sauté until slightly softened, about 3 minutes. Add garlic and sauté for a minute or two until fragrant. Add tomato paste and stir well to combine with veggies. Add cooked ground beef back to the skillet and season with remaining salt, pepper, rosemary, thyme, and Worcestershire sauce. 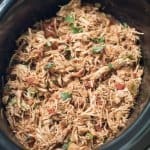 Reduce heat to MEDIUM-LOW and allow to simmer for 2 to 3 minutes. Combine the beef broth with the cornstarch and add to the skillet. Cook and stir over MEDIUM heat for 2 minutes or until thickened. Stir in frozen peas and corn (no need to thaw) and allow to simmer for 2 to 3 minutes just until heated through. 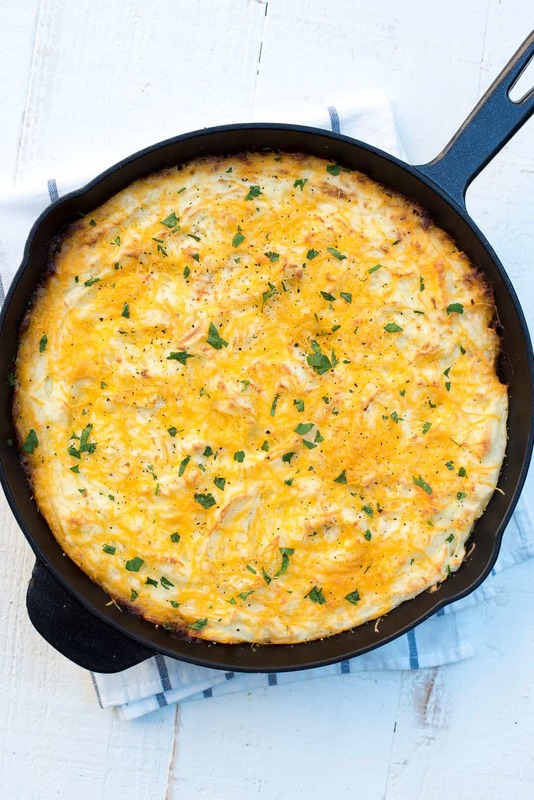 Remove skillet from heat. When potatoes are fork tender, remove from heat, drain well and add the potatoes back to the warm pot. Place milk in the microwave for 30 seconds, just until warmed through. Use an electric hand mixer to mash the potatoes slightly. Add the warmed milk, sour cream, softened butter, and salt and continue to mash until smooth. Dollop spoonfuls for mashed potatoes over the top of the filling and use the back of the spoon to spread it out evenly. Sprinkle with cheese. Transfer skillet to the preheated oven and bake for 20 to 23 minutes, until bubbling around edges. Turn oven to BROIL and watching closely to be sure it doesn't burn, continue to cook just until golden brown. Remove skillet from oven and garnish with minced fresh parsley and fresh ground black pepper. Allow to sit for about 5 to 10 minutes before serving. Freezer instructions: Prepare the beef mixture, cool completely and transfer to a freezer-safe container. Freeze for up to 2 months. When ready to use, thaw in refrigerator overnight. Heat partially thawed filling in a 12" oven-proof skillet, adding a little water or beef broth to thin, if needed. Proceed as directed for remainder of recipe. 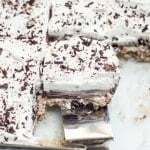 I make this all the time because it is one of my husband’s and mine favorite. The only change I make is that I do not add peas. I NEVER add peas because my hubby hates them. I do add mushrooms because we both love them. I just told him tonight that I would make it tomorrow for dinner and he was extremely happy. Thanks for sharing this one. 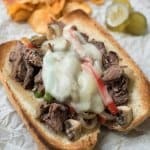 I made this last night and it was delicious! Thanks for a great recipe. Love this. Served in a skillet like this it’s just more appealing! I agree, Mimi. It does add a nice touch and food cooks up so well in cast iron. Made this tonight and it’s phenomenal! My kids love it too!! Welcome to the world of blogging. Brace yourself, it can be a bumpy ride 🙂 All jokes aside, food blogging is wonderful work if it is your passion but I will stress the word “work” here. It requires a huge amount of work and effort to build a successful food blog. There are tons of great resources available to new bloggers. 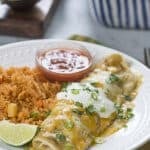 I’d recommend checking out Pinch of Yum’s Food Blogger Pro. Lindsay and Bjork have been at this for a long, long time and they are real pros when it comes to helping others through courses, videos, and online forums.